Manufacturing tools: Quiter has its own modern tool manufacture, guaranteeing the company’s high flexibility and cost efficiency. CNC operated copy-milling machines and electrical discharge machines yield precise tools and the basis for the high quality of the finished product. 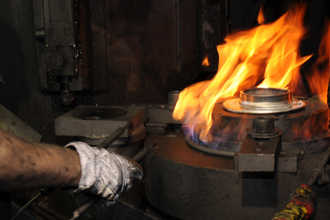 Forging moulded parts: Once manufactured, the dies are then put to work in the company’s own press plant. With a pressing power of up to 1,600 metric tons, metal parts weighing up to 3 kg can be forged here. Handling materials: Automatic precision lathes and CNC processing centres handle the machining for serial production. Even the most complicated components are no challenge for the variety of tools available at Quiter. Assembling fittings: Using automated assembly lines, forged parts are turned into complete fittings. Highly trained employees oversee the procedure with the greatest care to ensure perfect results.